In February, Gov. 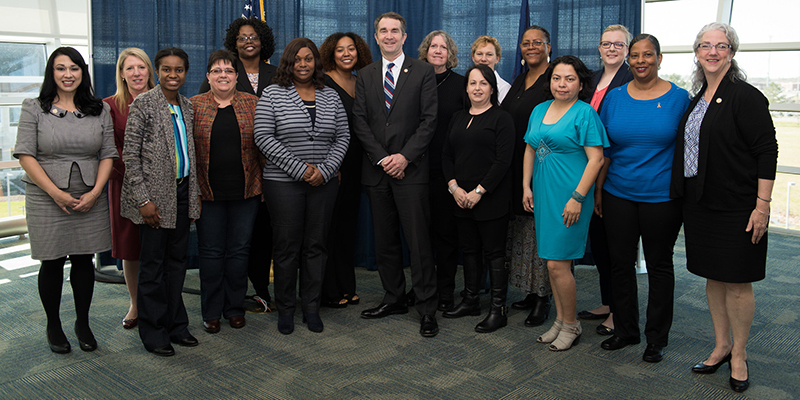 Ralph Northam and the General Assembly declared the third full week in March as Women Veterans Week in Virginia. 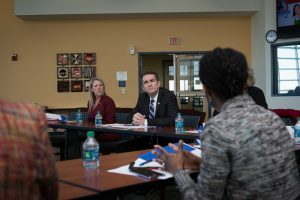 On Friday, the inaugural observance concluded with a roundtable at Tidewater Community College’s Virginia Beach Campus to give female veterans a chance to bend the governor’s ear on issues important to them. The event was organized by the Office of the Virginia Secretary of Veterans and Defense Affairs and TCC’s Center for Military and Veterans Education. Northam said his administration will continue efforts from the previous administration of Gov. Terry McAuliffe to improve veterans’ experiences in Virginia. “We have effectively ended veteran homelessness,” he told the 13 members of the roundtable. “Through our Virginia Values Veterans – V3 – program more than 31,000 vets have been hired.” The goal, he said, is to keep valuable, well-trained former military personnel in Virginia. He noted that Virginia has the largest percentage of female veterans in the country, and he wanted to hear from the panelists about their challenges. “No it’s not,” the governor responded with a laugh, adding that he wants to keep medically trained veterans in Virginia by further streamlining the process of getting corpsmen and medics into civilian jobs through Virginia’s Military Medics and Corpsmen (MMAC) Program. The women made a point that, after 20 years or more of service, veterans are eligible for benefits including health care and mental health counseling. “But if you don’t have 20 years or you don’t have a job, you’re on your own,” said one panelist. Northam said that situation would improve if a state budget is approved with an expansion of Medicaid. Child care is another hurdle for not only veterans, but also active-duty service members – especially single parents. “If you don’t have income, you can’t find child care and you can’t go to school,” said Cassandra Harris, an on-base TCC representative at Naval Station Norfolk. Child care providers need to be trained in how to deal with children whose parents are in the military, especially when they are deployed. “They need extra care,” said Dawn Johns, a TCC student. “They need someone to watch and understand their actions and behavior.” She said her daughter attends TCC’s Child Development Center, operated by the YWCA of South Hampton Roads, on the Portsmouth Campus. Kathy Owens, a retired Navy pilot, said some reciprocity or coordination among states with school calendars, GPA calculations and advanced placement credits would also be ideal. Two new members of the House of Delegates from Virginia Beach, Del. Cheryl Turpin and Del. Kelly Convirs-Fowler, were on hand. Also among those in attendance were representatives for Sen. Mark Warner, Sen. Tim Kaine, Rep. Donald McEachin and Rep. Bobby Scott.